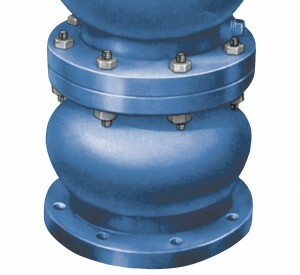 The Surge Check Valve is designed for installation to the inlet of the existing Air/Vacuum Valve on the line. It consists of a body, seat, flow-disc and compression spring. The surge check unit will operate on the inter-phase between the kinetic energy and relative velocity flows of air and water. After air passes through and water rushes into the surge check, the disc starts to close, reducing the rate of flow of water into the air valve by means of throttling orifices in the disc to prevent water hammer in the air valves. The surge check orifices are adjustable for regulation in the field to suit operating conditions.